This salad recipe can be made with leftover turkey, or a turkey breast or the thinly sliced deli turkey available in the market. Keeping the salad somewhat chunky is part of what makes it good, so here i'll be using the oven roasted thinly sliced deli Turkey with Homemade Italian Dressing, greens and vegetables. In a bottle or cruet, shake together all ingredients, except oil until well blended and salts have dissolved. Add oil and shake to mix. In a large bowl toss Turkey, halved cherry Tomatoes, sweet Pepper, Onions, Beet, jalapeno, Salt and Pepper. Arrange Greens (Romaine & Iceberg blend) in a salad bowl. Top greens with the above Turkey mixture. 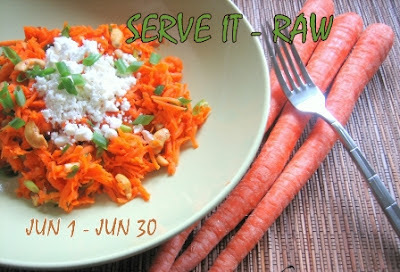 My entry to Serve It - Raw & Oh Taste n See…..